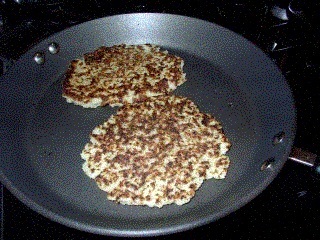 Latke is a Yiddish term. Others call them potato pancakes, but they are one in the same. They are thought to have originated in Eastern Europe or possibly Germany in the later part of the 18th century. Latkes were brought to the United States by Jewish immigrants. It became part of the Chanukah tradition. It was quick to gain mainstream popularity and has maintained its allure ever since. A cooked stack of latkes in the fridge makes for a quick snack, just warm them in the microwave and have them with a dab of applesauce. But I really like them with eggs at breakfast where they are a special treat. Peel potatoes and onion. Finely grate potatoes and onion. You may use a food processor but do not over process and make a puree. Put grated potato mixture in a bowl. Add egg, flour, baking soda, pepper flakes, salt and pepper. Stir to mix well and moisten all ingredients. Let sit 10 minutes. In hot pan (350°F) add enough oil to coat the bottom (a spoonful of bacon fat in the oil will add a lot of flavor). Take a ½-cup portion of the mixture, use hands to form portion into arouind, pancake shape. Lay in the hot oil. Repeat with remaining potato mixture. Do not overcrowd pan. Two or three latkes at a time is enough for most pans. Cook until crispy and golden, about 5 minutes. Turn to other side and cook until crispy golden, about 4 minutes. I have noticed that it is easier to undercook than overcook - make sure it is done (I guess that means you get to have the first one). After cooking, place on paper towel for 2 or 3 minutes before plating.